The Rajasthan University of Health Sciences (RUHS) Candidates declared as QUALIFIED in the B.Sc. Nursing Entrance Examination, 2018 shall have the time to submit shortly the duly filled-in Online Option Form for admission at Government Nursing Colleges, Government aided Self-Financed Nursing Colleges and Private Nursing Colleges. Rajasthan State Government Reservation Policy Guidelines. 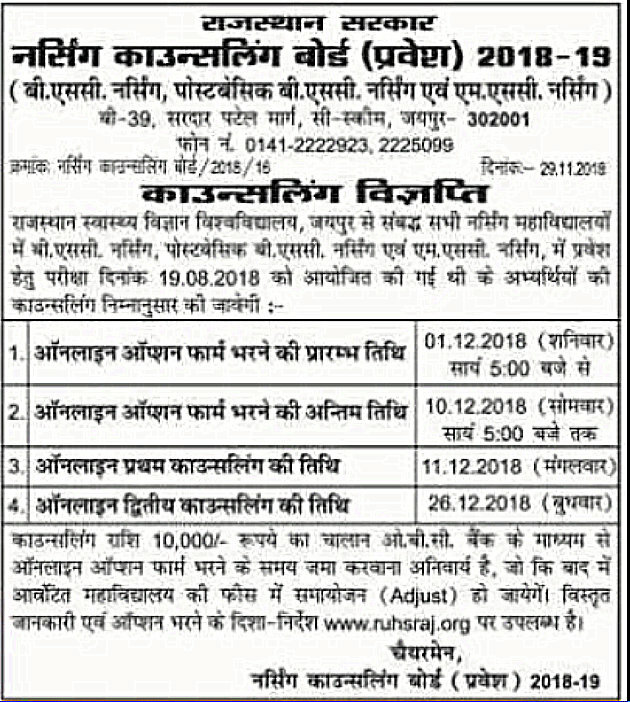 We are watching out for the Rajasthan University of Health Sciences communication regarding the Second Round of Counseling including the Online Option Form Filling and Submission informing the Date for the 2nd Counseling, which would be displayed on our Website for the ready reference of the candidates. The candidates may like to log on to Rajasthan University of Health Sciences Website Click Here for assistance, if any, required. According to me bsc nursing counsling form release date between 21st October to 25th October and for more information please visit official website of http://www.ruhsraj.org.in !! From where you get this information . Please tell me about councelling,merit of rajasthan university. Plz… Tell.. Something.. About.. Counselling.. Date.. Plzz..
Hey ANjani Ram, RUHS will take more time to issue the counseling session for admission in B.Sc Nursing course. Bsc nursing 2018 ki counciling kb hogi?? Or sc ki cut off kitni jayegi? What is the cut off of Ruhs bsc nursing 2018 obc girl’s for govt college. Almost gen and obc cutoff 59&55 marks..
Dear Alka, When RUHS update any information regarding B.SC Nursing counseling dates then we will notify you at this web portal. I have submitted 10000 RS for BSC nursing after last date and bank had cut the challan but ruhs website is not accepting my form what is the refund process? sir if I dont want to join 1st round counselling allotted college of bsc nursing then my chalan amount 10000 will be refundable or not? Is bar jhodpur govt cllz list me to nae tha. Dear Pramesh Katija, RUHS B>SC Nursing ANM & GNM 02nd counseling date is likely to release soon through the official website. Request clarify about fee structure of RUHS bsc nursing 2016(Govt college as well as Pvt College). Second round counseling date also inform. Sir mere exam me 47 nm. h or m obc me hu . meri rank 898 h. Mughe 1 st counseling me Athina clg bhiwadi mila h. Kya 2nd round me mughe koi government clg mil sakta h …. Plzz tell me sir ..
Sir mere exam me 47 nm. H or mughe Athina clg of bhiwadi private m add. Mila h . kya 2nd round me mughe government clg mil sakta h . plzz tell me sir quickly . i click for 2nd round m.sc nursing counseling ….but i dont want to take participate in 2nd round counseling….i ‘m satisfied with 1st round seat allotment …..what should i do…. now I dont want participate in 2nd counseling…what should I do …plz sir help me…….I’m satisfied with 1st counseling…. Monu result kab aane wala h counselling ka please information. Bhai collage mile kiian tum he. Dear Pramesh Katija, The RUHS B.SC Nursing Admission Counseling date is likely to display soon through the official website. Dear Priyanka, The RUHS will take more time to upload the counseling schedule of RUHS B.SC Nursing 1st-2nd-3rd rounds seat allotment through the official web page. sir, site pr councelling ka option to aa gya pr server error aa rha h ab btao ki counselling kase kre!! Counselling ka sms to aa gya mobile par but ruhsraj par to koi jankari nhi dali hai counselling ki . koi link nhi aa rha bhai RU ki website pr……..
councelling me agar residents certificat nahi ho to chaleaga kya? bhaiyon kuch sites per ye aaya h ki 10 september se counslling shuru ho gai and ye bhi de rakha h ki seat aalotment ka result aagaya. kya ye sahi h ya galat h please tell us……. Candidates can check RUHS B.Sc Nursing Counselling Allotment Results 2016 10th Sept 2016 1st, 2nd, 3rd Seat from the direct link provided below. This year it has released notification for the RUHS B.Sc Nursing Counselling Allotment Results 2016 10th Sept 2016 1st, 2nd, 3rd Seat examination and the candidates who had written the exam can check the results from the official website. Candidates who had written the exam can check RUHS B.Sc Nursing Counselling Allotment Results 2016 10th Sept 2016 1st, 2nd, 3rd Seat Results 2016 from the direct link provided below. all candidate should check result name wise and roll number wise and see cut off marks category wise. ruhs link for b.sc.nursing 2016 counselling? Sir web site pr sirf date batayi gyi h online form bharne ki…….lakin koi form link to show hi nahi ho raha h………or sir jo 10000 rs h wo refund ho jayege kya agr koi college na mile to…..
sir send me the linking website and complete information regarding b.sc. nursing counselling 2016-17.
sir the link is till now not updated on RUHS website. Sir …bsc nursing m 10 or 12 ki percentage ka weightage judta h kya…. Dear Sushant, While Filling RUSH ACADEMIC QUALIFICATION Course of Duration for the HIGHER SECONDARY / SENIOR SECONDARY / INTER will be ONE Year. SO Fill it & Complete the Application Form. Best Wishes for Exam. Very lazy website of RUHS ….no declare any date for next counseling . Number of students puzzled and rising same question. University pl, update every event or changes in web site so parents as well as students are aware. 2nd counselling has been done and provisionally selected candidates list has been uploaded. next counselling shall be conduct soon by the University, if required. sir b.sc nursing ki 2nd counslling hogi be yha nai. agar hogi to kab ? sir please tell me soon. sir mere ST me 42 rank hai or overall 986 rank hai .sir mushe aashani se govt. college mil jata, lekin sir gulti se emitra vale ne no. 1 per private college or no. 2 per govt. college ber diya. or mushe counselling me pvivate college mil gaya. sir mena 2nd counselling be kar wai hai.sir kya mushe 2nd counselling me govt. college mil gayaga. dates are not yet updated at the official website. it will be soon conducted and dates will be mentioned here. If you have received a letter of seat allotment (showing seat allotment) then web advice you to contact them with your letter. dates will be mentioned soon. Provisional Allotment list has been uploaded a the official website of RUHS, and to know the Provisional List plz click on this link and check your Name http://216.55.163.156:90/ruhsresources/hotLinksData/4874/Provisional_List.pdf. list has been uploaded plz click at this link http://216.55.163.156:90/ruhsresources/hotLinksData/4874/Provisional_List.pdf. Provisional List of Allotment has been uploaded, you must click at this link http://216.55.163.156:90/ruhsresources/hotLinksData/4874/Provisional_List.pdf.